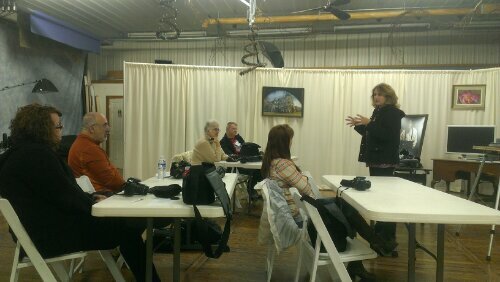 Kathy teaching tonight! Show and tell, all about flashes. Look at what the Easter Bunny dropped off early for us! Have your little one come in and get a great portrait that you can enjoy throughout the year. Our set up in our studio is equipped to satisfy your needs. We have some props, but you are always welcome to bring your own. An all-day event to learn how to use your camera and take it off Auto. Settings, depth of field, f-stops, shutter speeds, ISO, scene modes and more will be discussed and tried. Bring your camera for hands-on learning for this fun day. Don’t let your camera intimidate you anymore! You will learn how to master your digital camera. Learn to understand what each function on your camera is and more importantly what it does. Not only will we explore the buttons and dials, we will cover proper exposure using ISO, f-stops, shutter speeds, depth of field, lenses, flash and composition. Discover how to stop the action of sports photos and learn how to take beautiful portraits of your loved ones. A separate weekend field trip is included to try out all your new skills.